If you’ve been following Facebook marketing, you know how important video is. Facebook has been pushing video, especially Facebook Live for the last couple years. As a digital marketing company, MorePro values video and we encourage all our clients to shoot and post more video content. However, it brings up questions as to how video affects website ADA compliancy. We mention video in some of our other blog posts about ADA compliancy, but we haven’t specifically discussed video and what you should do to make it ADA compliant. Making video ADA compliant helps it reach the widest audience possible. It’s not only the right thing to do but ensures your video can be see by everyone who has interest in it. And that’s why you create video in the first place! If you aren’t already aware, website accessibility is covered under the Americans with Disabilities Act. While you may be familiar with the ADA in terms of facility access – wheelchair ramp, handicap restroom, etc. – many business owners don’t know that their business website is also included. This means the website must be designed in a way that people with disabilities can access the information. For an overview of the changes you should make to your website, read our post Help Make Your Website Compliant with these 10 Steps. Unfortunately, serial litigators are looking for business websites that are not compliant. Fighting a lawsuit is a costly and time-consuming process that no business owner wants to go through, so we recommend being proactive by making sure your website – including video – is ADA compliant. 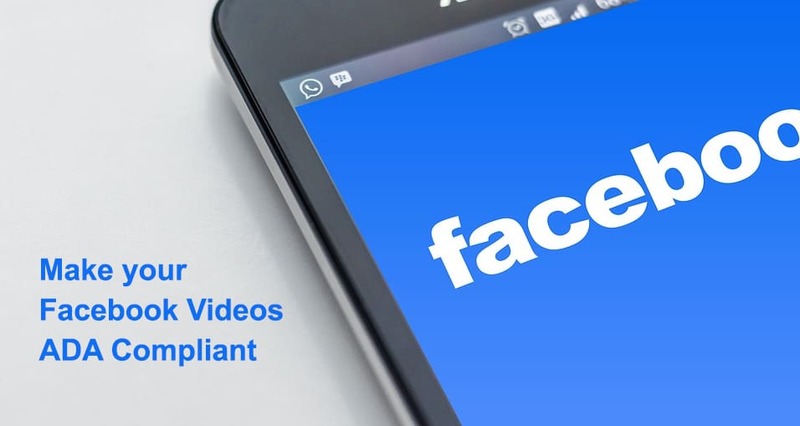 There are three options for adding Closed Captioning to Facebook video: Facebook can generate the caption, you can write them yourself within the Facebook platform, or you can upload an srt file. Here are the steps provided by Facebook at the time of this post. Click Photo/Videoat the top of your Page’s timeline. Click Upload Photos/Videoand select a video from your computer. Once your video has uploaded, click Subtitles & Captions (CC)in the column on the right. Next to Video Language, select the main language spoken in the video. Once your video has finished uploading, select whether you’d like to auto-generate captions, write them yourself or upload a SubRip (.srt) file. If you choose to upload a .srt file, make sure that your caption files are correctly named and formatted before you upload them. To add captions to an existing video on your Page, find the post on your Page’s timeline, click in the top-right corner, select Edit Post and follow the steps above. Note: People who watch your Page’s video with sound turned off will automatically see captions. People who watch your video with sound turned on will need to turn on captions to see them. The language people see captions in is determined by their preferred language. We have a 20-year track record of improving digital marketing efforts for both large and small businesses. To help our clients and other businesses meet ADA guidelines, we have developed two website ADA compliancy solutions – WordPress and Custom Programming. If your site was built in WordPress, you’ll choose the WordPress ADA Package option. If your site was built on another platform, we can provide a custom programming solution. Either way, we’ll perform the work quickly and effectively.